Angèle Etoundi Essamba was born in Cameroon, educated in France and she graduated from the Photo Academy of Amsterdam where she lives. 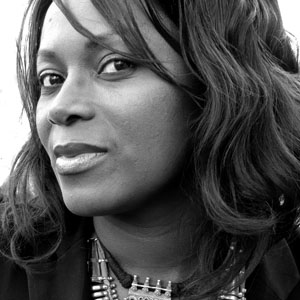 She is today one of the most acclaimed African woman photographers of her generation. Since her first exhibition in 1985 in Amsterdam, her work has continued to be exhibited in museums, institutions, art fairs, biennials and galleries in Africa, Europe, the United States, Latin America, Arab Emirates and Asia. Essamba’s work lies at the intersection of the social/gender and the artistic field. She uses her photography to bring her message across in a creative way. Her varied background and various travels and exhibitions have not only profoundly shaped her eye, but also mede her outlook to be equally aesthetic, idealistic, realistic and societal. Therefore, she joins the spirit of humanistic photography with a strong attachment to the values of communion. Women constitute the main subject of her artistic expression. She is a committed artist involved in a reflection on the identity of the African woman. She records in an aesthetic way a vision on the African woman and the African culture, giving a new interpretation of the contemporary Africa. In her work, she challenges and breaks with stereotypical representations of women, instead she chooses to give her subjects meaning and greatness. Keywords for Essamba’s work are: pride, strength and awareness.